During a grand opening celebration held Thursday at the White Lily Chapel in Ashley, more than 50 older adults gathered for food, music and games. Nutritionist Karen Pillion, left, of SourcePoint, who designed the menu for the event, serves Amy Runyan, right, a cookie. Hoping to encourage Delaware County’s older adults to be more engaged, while enjoying a hot nutritious meal, SourcePoint kicked off the opening of a community café at White Lily Chapel in Ashley on Thursday by hosting a grand opening celebration. Yeager said it’s a challenge for some people living further out in the county to get into Delaware and SourcePoint for activities on a regular basis. The White Lily Chapel café gives older adults the chance for socialization in the more rural areas like Ashley. Yeager added SourcePoint was expecting 51 people for the luncheon at the chapel on Thursday with a few walk-ins. Looking around, she said it looked as if everyone did show that sent their RSVP, plus the few walk-ins. Karen Pillion, SourcePoint nutritionist, who designed the food for the café, said SourcePoint has seen a 16 to 17 percent growth in the nutrition program this year. Pillion said that SourcePoint operates four cafés in Delaware and Sunbury, serving lunches to adults 55 years and above that are all in senior centers. She said because SourcePoint was wanting to reach further out into the community, it decided to have a conversation with White Lily Chapel about starting the café. 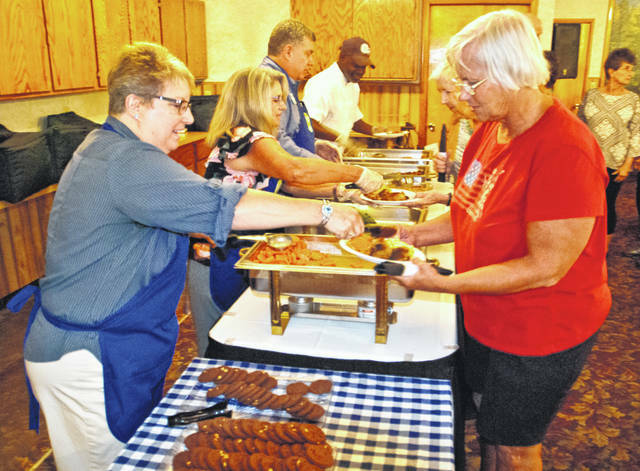 Pillion said that the food served Thursday was the same food that is delivered by the Meals on Wheels program. According to Village of Ashley Mayor Jim Nelson, the food was excellent, the music was excellent, and the café is a great project for the village. “It’s very helpful to get people involved and have a nice place to come and eat,” he said. Village council member Jym Longstreth agreed with the mayor on both the food and music. The music was provided by Fine and Dandy, a duo of a flute and guitar. The SourcePoint Café at White Lily Chapel, 20 S. Main St., Ashley, is open to seniors every Thursday and Friday from 11:30 a.m. to 1 p.m. Starting Thursday, July 19, several menu options will be available, and reservations are to be made two days in advance at 740-203-2432. For more information on community cafés and other nutrition services, go to MySourcePoint.org/nutrition. This entry was tagged Alison Yeager, Ashley Ohio, D. Anthony Botkin, Jim Nelson, Karen Pillion, Sourcepoint, White Lily Chapel. Bookmark the permalink.